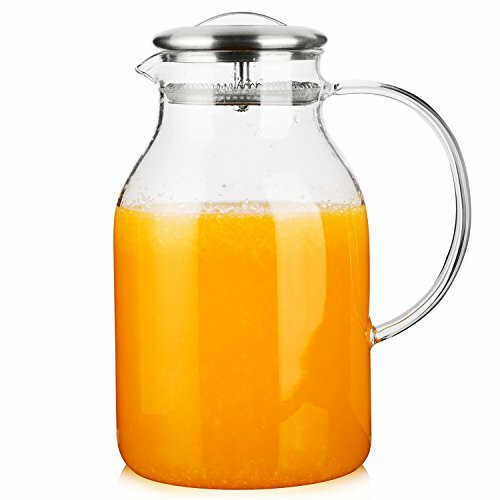 Hiware Glass Pitcher is made from borosilicate glass which is lighter and stronger than regular glass, hand blown, heat-resistant and 100% lead-free. You can make tea, milk, juice, ice water, or white sangria, or anything you can think, with this pitcher. Our glass is slightly heavier than others on the market ensuring both the feeling of quality and the longest possible durability. Please rest assured that use. 100% SATISFACTION GUARANTEED: If you aren't 100% satisfied, just contact us! We promise your money back or replacement with no questions asked or charge. Dishwasher safe, hand wash recommended. Easy to clean.